When mark instance, he y dedicated in real estate began in grew jaded working in communihonest cons ustry. “I retired from that n. Backed accurate rec ys, “and was living off of CONTENTS ed out to a friend, ng with a lookare based on work, maybe as an office ng Detailed adv erredbuyers’ me to Valarie BrooksTO Real GET Estate THE BIGGEST 4) R.HOW 19) 6 THINGS ALL ed working as her office admin. Fast forearned his one of the top producers OUT OF YOUR SUCCESSFUL NEGOTIATORShome DO is follo s, and I’m now RECHARGE ater, to North Carolina in 2005. photography, including aerial photograph t’s like relocating a fairy tale.” Nykole points to the LUNCH HOUR ss environment that Valarie R. Brooks has irtual organization is a thriving local team “We syndicate to theBUSINESS major real estate w 22)then ARE YOU DOING Charlotte Homes as one of many reasons “It’s definitely a13) team mprising 300 agents and 6 she states within And Lake Crew has a lot of F Aenvironment,” STEP-BY-STEP GUIDEthe TO websites. AS YOU ONThe FACEBOOK? ot every man or woman for themselves. INTERNET LEADS Instagram followers, so our social media pre work makes the CONVERTING dream work. Plus, Valarie es her agents which add to SALES our front of the right people.” TO definitely REAL LIFE of new business from return clients and assist someone with purchasing their Kelly investshome, himself acquiring in client interactions. a his new property for With eed advertise his business. Service speaks Richhepersonally and his team buyers, for instance, provides a guarantee. If members in the first year also won’t hesit their portfolio, or to sell a property homeownership, his buyer realizes that they made the wrong wever, invest in building and training ofpurchase the of isthe night,them. ifbutneeded for a client. “I like th that distressing I’m armed – whether they love the house hate the neighbor’s with proven leadership, world the house market issays turning out to be “That’s too much work professionals possible. “Clients comedogs, toor whether estate,” Rich. where I get a lot of class connections and a winning teamone can – Kelly will list their house for them for free. “No Phone 888-461-3930 | Fax 310-751-7068 onesty and knowledge,” says Rich. control “In what’sready with problems goingtoonthem, at work orsolving in someone else’s help anyone with their reallife, but and consulting mag@topagentmagazine.com | when www.topagentmagazine.com people estate come home at the end of the day, they should be goals.” n an appraiser, I have flipped houses and estate, whether that b able to exhaleconstant and have peacechange and solace,of and real not wonder, ‘ No portion of this issue may be reproduced in any manner whatsoever without priorTo consent of the publisher. 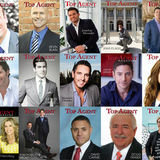 Top Agent find out more about Leonn What was I thinking?’” To learn more e experience; done hundreds and new inventory or in training Magazinewe’ve is published by Feature Publications GA, Inc. Although precautions taken to ensure the accuracy of published Nykole isand alsoare a different dedicated philanthroyou can contact her via email at leo materials, Top Agent Magazine cannot be held responsible for pist, opinions expressed or facts supplied by its authors. and she is active with numerous visit Ke His guarantee speaks to his integrity. With listings, Kelly spares ns; we’re Towell past theaddress, point making team members. or by phone at 919454 4932 subscribe or change sendof inquiry to mag@topagentmagazine.com. organizations. She is currently workno expense in marketing, but he also goes against some trends or go to his Published in the U.S. flawless service with the American withisexcellenting success. “Many agents Cancer are doingSociety, ‘coming soon’ ways Rich delivers email Kelly marketing, but I don’t,” he says. With patients coming-soon listings, he volunteering to drive to doct, candid approach to every relationship. To stayonlyfresh and says, a housetor is appointments. marketed toShe other agent; call also sits arecharge onbuyer the might regularly,orRich Company Listing board the local chapteras of the Northas Top est all 2the time; we keep people informed withof his family well giving back to com Agent Magazine ive.” in need. In particular, he personally supports www. visit SeeTriangleAreaHomes.com, or visit his Facebook page here. www. 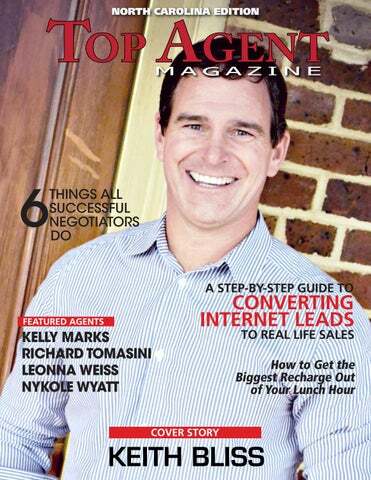 To learn more about Kelly Marks, visit KellyMarks.com or go to his Facebook page, email Kelly@kellymarks.com or call 336.346.1253. www. To learn more about Rich Tomasini, visit rich.tomasini.exprealty.com or go to his Facebook page, www. is vacant, they get what I call a soft stage where my stager will go in and dress up certain areas,” she explains. A licensed appraiser measures the listing and creates a floor plan. Leonna also hires a professional photographer to take photos that show off the property’s best features. She also does drone photography and videography for certain properties. To market a listing, Leonna first creates a pre-listing buzz on social media with both potential buyers and agents. She also reaches out to all her contacts to let them know she has a listing coming soon. She door knocks to inform neighbors the house is for sale, and hosts well-attended open houses Her clients rave that she uses her teaching background to walk them through the process step-by-step. Sellers say she helps them create a detailed plan for buying and selling in an efficient manner, even in a tight market. What’s Leonna’s favorite part of the job? “I love being around people who are planting their roots and looking to make a change in their lives,” she said. “I grew up in a military family where we moved around a lot so I wasn’t able to plant roots. I feel passionate about helping families to do that for themselves.” In more challenging situations such as divorce, Leonna likes to help people get to the other side of a stressful change and find relief. In her cherished free time, Leonna spends time with her four children and supports their activities in the community. She enjoys traveling with her family a couple of times a year. For the future, she wants to continue growing her referral base and her business, providing top-notch service to her clients, and increasing her presence throughout her community. Now those are worthy goals and ones her clients will appreciate!